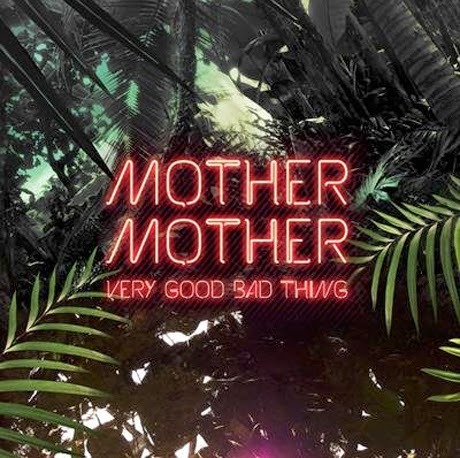 Vancouver's Mother Mother have always been an acquired taste. They are fearless when it comes to cobbling their songs together, which can result in a lot of 'WTF is this?' reactions. The WTF reaction one gets with their new album Very Good Bad Thing is different however. It's one that's born out of how uninspired and conventional the record is. The album kicks off with what is the fairly typical Mother Mother track (as far as there is such a thing) "Get Out of the Way". Ryan Guldemond drops his Spoken Word/awkward nerdy rap hybrid vocals over a Gothy electronic arrangement. The band seems to be pandering to the dance club DJ with the forgettable "Modern Love". "Monkey Tree" is the generic kind of electro indie pop (plus falsetto) that currently permeates the blogosphere. They seem completely disinterested as they go through the motions on "Kept Down". It's latter day Depeche Mode that appears to be the influence on "Have It Out". They do venture out for a handful of experiments. In the case of "Reaper Man" it comes out sounding like one of the songs from the Revenge of the Nerds talent show. I'll leave that to you to decide whether that's a good thing or a bad thing. The dual vocals on "I Go Hungry" are off from each other just enough to be reminiscent of the best work of Francis/Deal. The highly charged "Shout If You Know" provides another highlight. It's not that these are bad songs when taken in isolation of expectations. However, we expect something more 'out there' from Mother Mother. This is simply too pedestrian a record. Mother Mother plays the Danforth Music Hall in Toronto on November 16th. Best tracks: "I Go Hungry", "Shout If You Know"